As I’ve been working more in VR alongside the home cockpit, I’ve been trying to video / stream of both. Each has its supporters, although on the whole my sense is that the YouTube audience prefers the home cockpit over the VR. I think that’s right. It’s a better visual experience (and not as potentially nauseating! ), and probably feels more “real” to the online viewer. Chas, who comments here often, is trying to get me to stream in 3D so others could use their own VR gear to truly see what I see, but I’ve not gotten there as yet. So I thought it would be interesting to post two recent streams here side-by-side. One is VR, the other home cockpit. I completed the home cockpit flight later today. It was fun, and it was certainly faster to work the GPS and the radios than in VR, and it was nice looking at a real iPad and ForeFlight display. But I have to tell you – it didn’t feel as much like flying. My plan is to probably stream in the home cockpit, but I’ll probably use the VR more often when flying on my own. I’m getting this question a lot, and a viewer seems to ask it in every live stream. So I thought I’d post a bit about how I consider the question, and why my answer is not as straight forward as some might expect. Right now, I would say that I prefer VR, but that’s not a consistent preference. It does change based on the situation. But I’ve noticed that as I go into the sim closet for a flight I’m more inclined to reach for the goggles instead of the remote for the projector. So let me get into some of the factors that matter for me, and I’ll contrast the physical and virtual cockpit experience in each. Note that I have an Oculus Rift, so I can’t speak to other HMD devices, and that I fly in X-Plane using native VR support. The home cockpit has an edge here. But it’s not about the goggles. I actually find the goggles very comfortable and don’t mind wearing them at all. It’s more about the overall comfort of being able to see your environment, put things places and see where they are, and the overall sense of physical freedom that comes with being able to see your surroundings. While I find the goggles comfortable, it’s nice not to have to peek under them, lift them up, etc. when I need to change a setting or grab a pencil. This isn’t a huge deal, but it is part of the experience. An easy win for VR. I picked up my Rift, which came with two sensors and two hand controllers, over a holiday sale on Amazon for $399 and I see it is still available at that price. The price for the home cockpit: no man can say! At least, no man should add it up if he doesn’t want to feel wasteful. For the quality of the experience, VR is in my view a significantly more cost-effective way to have a very immersive simulation experience, presuming you have a system powerful enough to run it. But that’s a wash, as you need a very powerful system to run three or four screens and a ton of devices in a physical cockpit, too. The Rift is the clear winner here. Getting a physical cockpit up-and-running is never a straight-forward task, although it provides a dimension to the hobby that many, including me, can enjoy thanks to its high geek factor. But the fact is that even the most basic home cockpit requires a fiddling with USB ports, hubs, drivers, power management settings, etc. that VR just does not require – and that an operating system update nearly always requires you to repeat in some manner. And this is before you get into the nuances of having your gear communicate easily with your sim, which adds a whole new layer of driver and software support. With the Rift I plugged the headset in, plugged in the two trackers, placed them in locations for good tracking, ran the Rift setup software, and was done. After that, and after learning the best practice for good performance on my rig which I detail in a post here, I made changes to the power management and overclock settings of my BIOS, PC, and GPU; changes to the SteamVR / Rift settings; and changes to the performance settings of some applications via Project Lasso. These were one-time changes, and candidly, they helped improve the performance of the physical cockpit as well. With VR you also don’t need to build a cabin. That was a fun part of the experience for me, but it was an awful lot of labor (be it a labor of love). A big nod to the Rift. As those who have built cockpits like mine know, it takes quite a while to get your aircraft and views set so everything looks just right, and in particular, so the front and side views appear in alignment and proportion. While I have posted how-tos on this (for P3D and XP) that helps people save some time, it still takes quite a bit of tweaking. In addition, in XP one needs to modify the aircraft models in PlaneMaker so that one doesn’t see unwanted parts of the cabin, and this also takes some tweaking. With the Rift you just launch a flight and go, although I do move my eyepoint around just a bit so that my yoke is where it should be given the virtual cockpit perspective. That takes just a few seconds, and I could modify the aircraft file’s eyepoint to make that setting permanent if I wished (but it’s so easy to do that I have not bothered). The Rift also wins for device configuration, as I don’t need to set up specific device profiles for the TPM etc. based on the controls of different aircraft I might fly. I just use the Rift controllers to manipulate whatever needs manipulating in the virtual cockpit. The Rift wins here, but it’s close. On startup in the cockpit I need to turn on all the monitors and projector, overclock the GPU, launch (and have run correctly) SPAD.neXt, RF Cockpit, and the program that lets the radios talk to the sim, then launch X-Plane. I have a variety of devices that make the home cockpit as realistic as it is, so for me this is more complicated than it would be for some. For the Rift I turn on the PC and its main monitor, overclock the GPU, open Oculus Debug Tool and set AWS to fixed at 45FPS, and launch X-Plane. I am going to call this a qualified tie. In terms of visual quality, the traditional cockpit wins. Sitting next to a 1080p screen (or higher) provides a very sharp image. BUT – my projector view is not nearly as sharp, and while it is 1080p I can see the pixels because of the image size, so it already has a subtle screen-door effect. While you can’t see this on my videos, you can in person. But with SuperSampling set to 1.6 or 1.7, the image in the Rift, to me, looks really good, and it is very difficult to describe the quality that 3D brings to the visual experience. I strongly prefer it to 2D even with its lower visual quality. In what may be a surprise to some, I’m going to give the nod to the Rift here. But your mileage may vary significantly, and there are situational variations. And as we get into this, note that I have a 908ti GPU and a i6700 CPU running at about 4.6, so hardware matters here. On my rig, even with all the tweaks I’ve made, in the physical cockpit I still frequently find micro-stutters, and in SoCal, low framerates unless I back of my settings some. I try to average 30 FPS, and X-Plane looks great at 30, but in congested areas it’s obviously lower and in the back country it’s closer to 50. Clouds don’t affect it much, although in IMC I need to back of my AA settings in the physical cockpit or things get slow quite quickly. When I first used the Rift, my performance was horrible. Unflyable for me. Stutters, judders, low frames. I was ready to take it back. But as I learned more about settings and made the changes I’ve pointed to earlier, I now actually prefer the performance I get in the rift. In the rift I have the same objects and texture settings that I do in the physical cockpit. I run at HDR, as I do in the physical cockpit. I use a lower AA setting, but it looks great thanks to SuperSampling. And because I have it locked at 45 FPS, the resulting performance is extremely smooth. No micro-stutters and a very fluid experience. In SoCal it gets worse, so I turn down the objects settings a notch. But I do this in the physical cockpit as well. So all in all, I actually prefer the Rift, which is a big departure from where I started. I call this a tie. “Feel” is a big deal in the real vs. VR debate. And when VR first came on the scene, I shook my head and said, “You can never replace the feeling of flipping a real switch or turning a real dial.” But this was before I appreciated what it was like to use the Rift’s controllers. The way they sit in your hand, the placement of the triggers, and the haptic feedback they provide makes turning a dial in the virtual cockpit feel very much like turning a real dial – or in the very least, it feels like you are turning or flipping something, and not just air. I didn’t appreciate this until I’d used them, and for me it makes a huge positive difference in the experience. And note that even in VR I am still using a physical yoke, pedals, and throttle quadrant, and I would say that all are essential to getting a more realistic VR experience. If I didn’t have them and was getting into VR, I would buy them (and probably a trim wheel, too). But there is another place where feel matters, and that’s the feel of flying in a real airplane. And for me, VR wins here hands down because of the nearly full field of view and the 3D image. In two years of flying in the physical cockpit only once did I get a sense of spatial disorientation. In the Rift I had it on the first flight, and on nearly every flight when I hit the brakes and the airplane pitches forward, I physically pitch forward with it. The sense of space and motion is so real that my wife can’t even wear the goggles or she gets sea sick. Now, I also use a Buttkicker to increase the sense of feel in my simulator (and in VR), but let’s be honest – it will always be difficult to get the feel of flying without a 6DOF platform on your sim, and even then it won’t be the same. But the Rift gives a very real sense of motion that is about as good as I could imagine without actually moving or feeling the G-forces, and it’s a big improvement to the experience over the physical cockpit with 2D images on the screens. An easy win for the Rift. I intentionally designed my home cockpit to be able to simulate a variety of GA aircraft (even though it’s built to closely replicate a Cessna 182). This is why I use an iPad for the six pack and FIPs elsewhere, and they can display many different gauges and glass instruments. But it strains reality sooner rather than later. It won’t, for example, do any sort of a good job replicating a 737 or F-18. It’s here that VR shines. And I’ll tell you, the first time you sit in the left seat of a VR MD-80, start flipping switches, and rotate for take off? That will blow your mind and bring a huge smile to your face. With the Rift I can simulate a huge variety of aircraft. Not all are VR ready, but that’s only a matter of time (and a short time at that). It’s fantastic. Rift, hands down. I love my physical cockpit and have gone to lengths to make it look and feel realistic (down to the sunshades). But it’s awfully easy to remember I’m sitting in my closet, and the 2D imagery on the screens and the little differences between them as good as my alignment may be are constant subconscious reminders that this is not real. I find the VR experience significantly more immersive, and I actually quickly forget that I’m in my home when flying VR. (Indeed, when you take the googles off, there’s always a bit of, “Oh wow, I’m in my house.”) Many things make it so: the 3D imagery, the 3D sound. But more so it’s the overall environment, and in particular, the light and how it acts in VR. In the headset light comes through the cabin, reflects off the surfaces, and moves through the overall world in a much more realistic manner than in the physical cockpit. No matter how good my screens, a flood light on the ramp to my right simply is not going to be bright enough to light up the entire cockpit. In VR it’s completely believable. It’s really amazing. I was never quite sure what people meant when they said VR was so “immersive,” but now with time in the Rift I believe it’s the combination of 3D imagery and the way light plays out in the scene. It’s something else. Think of it this way: when I have someone in the physical cockpit with me, they think it’s amazing and often they say, “This is so cool!” When I then put the Rift on them and have them take a few turns in the virtual aircraft, the immediately say, “Oh … WOW.” And then they’re just sort of silent and amazed for a while. A win for the physical cockpit. What’s more fun that having someone fly along with you? This is why I put dual control in my cockpit and it’s a big part of the appeal – especially when you can have someone sit in a sim for their first time. It’s just a lot of fun to share this experience with friends and family. And while the simulation community is hard at work finding the best way for people to fly pilot / first officer in VR, we’re not there yet, and modern GPUs simply are not powerful enough to run dual HMDs. And besides, what’s the point of sitting next to each other if you can’t look at each other? “What about charts and things you need to write down?” is a question I often get. The physical cockpit wins here, but VR is serviceable. 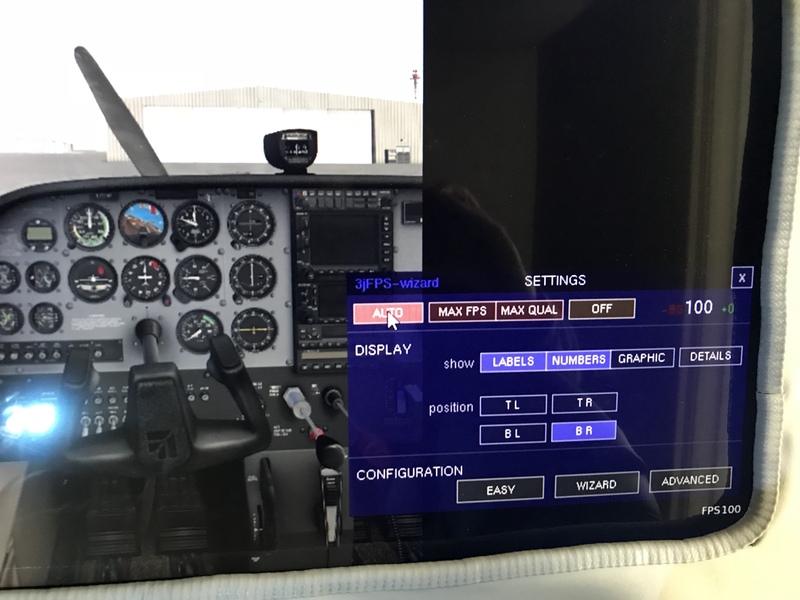 I can peek under the headset and see and use my kneeboard relatively easily, and now thanks to Oculus Dash and the ability to mirror my iPad to my PC, I can have ForeFlight in the virtual cabin with me. But it’s not as easy as having the iPad on the yoke and seeing my full kneeboard with a glance, that’s for sure. It’s workable, but not excellent. I do find, though, that it adds a layer of task saturation to the experience, which I think is good for me as a pilot rather than bad. Here VR wins the sprint, but I don’t know if it will win the marathon. What I mean by this: as a student pilot just about to take my Private check ride, it was clear to me after just a few flights that the VR is a far better training device for me than is the home cockpit. This might surprise some folks, and it surprised me too, but here’s why. First, the sense of space and motion afforded by the VR’s 3D imagery is significantly more life-like than that provided by the 2D images and environmental lighting of the physical cockpit. The pattern looks more realistic, the sense of size and perspective is spot on, and I find the sense of motion for the aircraft (especially on final) much more true to life in VR. And VR flight at night? A black hole looks like a black hole. It’s remarkable. If I want to practice maneuvers or landings, I want to do it in VR. In addition, in VR I can simulate the exact aircraft I fly in real-life: a Piper Archer II. While the sim version doesn’t have the GNS 430 that I do in the real aircraft, everything else is just where it should be. This means that not only are my visual references for the scan correct, but my flow for my checklists is correct. Practice makes permanent, and when I would spend a lot of time in the home cockpit and then get in the real airplane, I’d always have to remind myself where things were, which is not a good habit to build. This impression is strong enough that when I took a real-world flight last week and a day after having done a two-hour thirty minute flight in VR, I sat down in the real bird and thought, “Oh, back again.” I even wondered why the clock was INOP when it had been working the day before … and then remembered that it was the VR clock I was thinking of. That doesn’t happen with the physical cockpit. Finally, I’ve found cross-country work in the VR to also be excellent training, especially with ortho scenery underneath. Things look good in the physical cockpit, but in VR the ability to see the scenery, identify landmarks, and look around the aircraft is just much more realistic. So why is VR in question for the marathon if it wins the sprint? Because I don’t yet know how good it will be for IFR training and its heavy dependency upon chart work. My suspicion is it will be better from a spatial disorientation standpoint, but worse for procedures. It will be a pain just to write down a clearance, I suspect (peek under the headset to write down the CRAFT). As the ability to bring references into the virtual cabin (as I do already with Oculus Dash and ForeFlight) improves this may well change. But I won’t really know until I start IFR training. In the meantime, I plan to try a few PilotEdge I-Rating flights in VR and see how it goes, and I’ll report back when I do. So all this being said, where does it leave me? If we consider the whole as being more than the sum of its parts, I prefer VR in combination with a physical yoke, pedals, throttle, and Oculus controllers as a training aid (at least so far for VFR training), as a more realistic overall experience, and simply as more fun when flying alone. It’s also faster to get up and running and has far fewer things I might need to tweak or fix along the way. It’s easier. I prefer the physical cockpit for flying with a friend, and for a complex flight that’s going to require a lot of note taking and chart work. It’s also nice sometimes not to fly with the nerd goggles (as my wife calls them) on my head. But all-in-all, most of the time when I go into the sim closet, I’m reaching for the VR goggles. I’m surprised by this, especially since I so strongly rolled my eyes and shook my head when people started telling me how great VR was in flight simulation. “No way can it be realistic or a good training tool when you aren’t touching the real radios,” I said. But I now will say I was wrong about that thanks to the Oculus controllers. I think the VR experience is more real than the physical cockpit, not less. In conclusion, if starting from scratch and my goal was to have the most immersive, most flexible, flight simulation experience, or if cost was a significant factor, I’d go with VR in combination with a good yoke (I love my Yoko), a set of pedals, a trim wheel, and maybe a throttle quadrant (although the VR throttles are quite good). If my goal was to share a project with my child or children, introduce others to flight simulation, do something at a very high geek level, or train for IFR (although this will certainly be an evolving part of the picture), I’d build a cockpit (and do so at a greater expense). The VR thing is real, it’s impressive, and it’s here to stay. If you can try it, you should. You might just find it transforms how you think about your hobby. I finally figured out how to capture Rift video using the Oculus Mirror tool and my NVIDIA Experience ShadowPlay feature (it’s actually quite easy, but it did take some research to figure it all out). I also shot some iPhone video up front so folks could see how I have the sensors set in my cabin, and I do two laps at night, one with HDR off and one with HDR on so you can see the difference. These reflect a change from my prior settings. I found that Oculus Debug Tool does a great job of locking the frames at 45 FPS, and this makes both the sim scenery and the Oculus movement very very smooth, especially if I have HDR turned off. As some have noted over in the Facebook VAG group the Debug Tool’s FPS lock doesn’t always seem to “take” when you first turn it on. It may have to do with having the Oculus software running first and launching from within it, but I’m not certain. Regardless, I now have the SteamVR improvement turned off in favor of those in Oculus and I like the results. I had fun shooting this, and I think it illustrates the quality of the experience in VR. One thing you absolutely cannot appreciate from this, though, is the experience in 3D. I’ll post more on this later, and thanks for watching. Last night I did my first PilotEdge flight using the Oculus. I loaded the sim at Oceano, which had several people online on the ramp and one flying the pattern, with the intention of doing a few laps of the pattern and then heading north over the hills for a lap or two at San Louis Obispo. Real-world weather (scattered 9,000) and time (night). The aircraft was a Piper Cherokee (can’t remember whose, but it has a 3D cockpit that works relatively well in VR). This flight was interesting, for a variety of reasons. First, the headphones on the Rift come off easily with a few turns of their screw. I took them off and used my real-world aviation headset over the Rift, and that worked fine. As far as the VR experience, frames were silky smooth with no judders using the settings I’ve posted, with the exception of a few long lags where the sim was clearly dealing with data. My instinct is that I have more of these with HDR on than off, but I don’t really know. There were probably four or five of them in the course of an hour flight, and after maybe a five or 10 second delay things resumed without any difficulty. Regarding PilotEdge, it worked as expected. I also used my real-world kneeboard to see how it would work, and was easily able to peek under my headset at it for frequencies I’d written down and at my phone (which was running ForeFlight). As for running the radios, the Cherokee I was flying has radios that work in VR but they aren’t optimized (you don’t turn the dial with your wrist like you do in the default 172). They worked fine, but I actually powered up my FlightIllusion radio stack and used it for the radios just by feel, and it worked fine (same for the Saitek trim wheel, which is just easier to use for me rather than reaching down between my seats with the VR controller). The key thing, though, is that VR combined with PilotEdge made for an extremely realistic flight experience. Being able to easily look around the ramp and spot other aircraft moving about, and in particular, being able to see other aircraft in the pattern in 3D and hear them on the radios, was remarkably lifelike. Same too for the sense of perspective and space. Looking at the field when turning crosswind to downwind, seeing KSBP coming up in the distance on final, checking my distance to the field on downwind – this was all extremely true to life in the VR, even at night. (Perhaps more so as you can’t see any textures.) I didn’t really need to check the map to see when I was at two mile final into KSBP as I could tell for myself based on my real-life flight experience. The motion of the airplane on takeoff and final was also more immersive in 3D VR. On final in particular I “felt” the little movements of the airplane up and down and side to side much more so than in the physical sim cockpit, especially with the crosswind I had going. These landings were much more like real landings to me. It will be interesting to see how long I go before flying in the physical cockpit again. VR has its issues for me. Too much time with the headset on makes my eyes a bit wonky, for one. I can’t fly with a co-pilot, for another. I expect that IFR work (with its charts) would be harder, for a third. But I rarely take long, co-pilot, or IFR flights. And for me, VR with traffic and real radio work over ortho scenery was an amazingly realistic experience. I can’t wait to do it again, and if you have the PC and GPU horsepower and are passionate about flight simulation, I think you really do need to give VR a look. After continued testing and trial, I’ve found settings that work very well for me in the Oculus Rift, with smooth movement and no judders. Sitting at Albert Whitted near Tampa I was getting 90-100 FPS before activating VR and 45+ with it at the default KSPG airport, and 60-70/45 with the custom KSPG (which is much more taxing). Weather was set to real world, with some clouds in the area. The 45 FPS held as I flew around the Tampa area, held when I turned on WorldTraffic 3.0, and held when I went from non-HDR to HDR lighting effects. I did have more pauses and stutters after moving to HDR, though, so I will fly with it at night only. Without WT3 I don’t know that I would have had these, and I also realized my custom KTPA was loading on top of the Tampa scenery package KTPA, so the sim was managing two large airports on top of each other. But the flying was great, and I’ll be using these settings going forward. And it was really great to experience a big airport with traffic moving around in VR. In the 3jFPS plugin (a must-have, in my opinion) I ran the wizard and set it to keep frames at 50, which I figure will keep me at or above 45 FPS most of the time. I still had a world full of objects even with the plugin running.